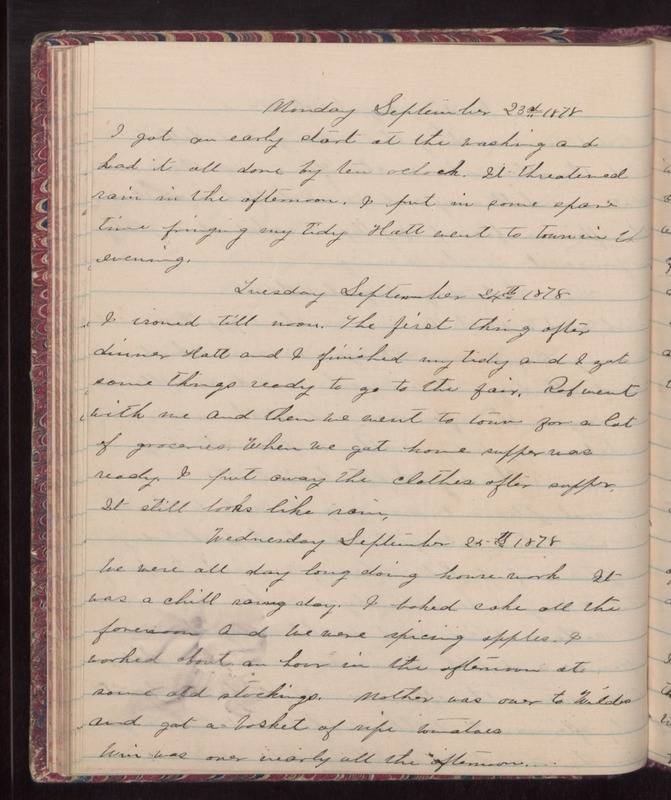 Monday September 23rd 1878 I got and early start at the washing and had it all done by ten oclock. It threatened rain in the afternoon. I put in some spare time fringing my tidy. Hatt went to town in the evening. Tuesday September 24th 1878 I ironed till noon. The first thing after dinner Hatt and I finished my tidy and I got some things ready to go to the fair. Rob went with me and then we went to town for a lot of groceries. When we got home supper was ready. I put away the clothes after supper. It still looks like rain. Wednesday September 25th 1878 We were all day long doing house-work. I t was a chill rainy day. I baked cake all the forenoon and we were spicing apples. I worked about an hour in the afternoon at some old stockings. Mother was over to Wildes and got a basket of ripe tomatoes. Win was over nearly all the afternoon.